If you are looking to replace your moisturizer for a better one, why not try Red Raspberry Seed Oil by Leven Rose? This product is made of only one ingredient, making it a better choice over other skin care products packed full of things none of us can pronounce. That is because it is 100% pure, organic, natural, and cold-pressed. Whether you have oily or sensitive skin types, this amazing red raspberry seed oil is sure to leave your skin feeling and looking nourished. According to the manufacturer, the product works well with all skin types, so there are no risks in using it. In fact, the manufacturer ensures that there are no parabens, alcohols, GMOs, fragrances, or other harsh chemicals added into the bottle. It does well in restoring fine lines and wrinkles that are usually caused by sun damage or aging. The product also has natural SPF properties, protecting your skin against UV rays. This way, you can apply it in addition to your sunscreen for better results. In cases such as eczema, psoriasis, burns, and rashes, raspberry seed oil is a good choice as it has high amounts of anti-inflammatory properties. If you are not sure if this is for you, the manufacturer offers a money back guarantee. Red Raspberry Seed Oil, created by Leven Rose. A lot of people with skin conditions and even those who are skin care enthusiasts love to use this product for a variety of reasons. Thus, it has garnered an average satisfaction rating of 4.8/5 stars. See what makes it a better choice among the rest as you read on. Unlike your moisturizer, this product is made of only one ingredient. And yes, this is seen as an advantage because there are no added fillers or harmful chemicals that may cause skin irritations and other side effects. This makes it ideal for all skin types. Whether you have a serious skin problem like eczema or just oily skin, this product is sure to be effective. Red raspberry seed oil is known to be rich in vitamins A and E, essential fatty acids, and polyphenols. When these nutrients combine, they are able to moisturize skin, protect it from common signs of aging, and enhance skin cell regeneration. Another thing that makes red raspberry seed oil a better choice is its natural SPF properties. You should use it alongside your sunscreen in summer so that you will have a great protection against harmful UV rays. Not only can you use it for your daily skin care routine but for travel as well. Because of its clear pink color, the seed oil goes on clear, leaving no marks. It is not sticky or too oily but leaves a slight sheen look on the skin in a good way. Aside from this, it also rubs easily to your body and face. For problems regarding the effectiveness of the product, just inform the manufacturer and they will be sure to send you the full refund of your money. This face oil has received a lot of positive reviews. However, there are people who simply do not prefer this kind of face oil. One of the things that some people do not like is the absence of the red raspberry scent. This problem is not really a big deal and is common to all organic skin care products. But if you are used to moisturizers with fragrances, then this might not be the best choice for you. Aside from this, there are also people who think that the oil level of the product is too low as compared to other face oils. 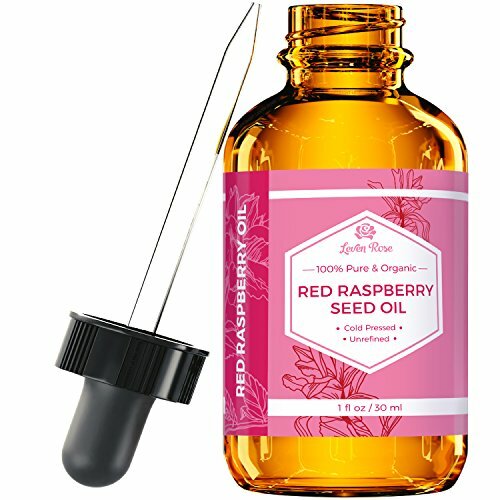 Red Raspberry Seed Oil, created by Leven Rose, there is no doubt why it has a whopping rating on Amazon. It is not from a well-known brand, yet it has all that it takes to become one of the best on the market. This product is therefore highly recommended.